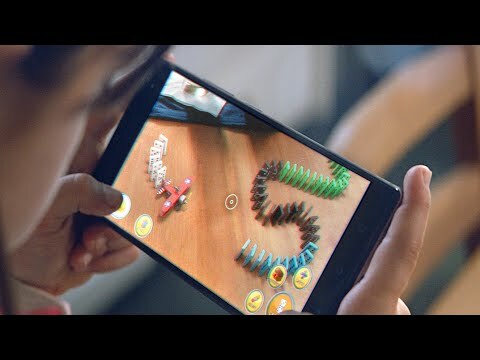 During yesterday morning’s Lenovo Tech World keynote, Google announced that Project Tango would be blossoming into just Tango, the consumer-facing end to the company’s AR (augmented reality) technology. With the launch of Lenovo’s PHAB2 smartphone, which so happens to be the world’s first consumer device to launch with Tango technology built-in, consumers will finally be able to get their hands on the project that Google has been working on for over three years. In a series of short videos, two of them being under 30 seconds long, Google details just a small fraction of things you can do with a Tango-ready smartphone. For example, if you are looking to buy a piece of furniture, but aren’t quite sure if it will fit, Tango — using its multi rear-facing cameras — can measure out the space exactly, taking all guess work and self measuring out of the equation. That’s a time saver. Another example, not detailed in these videos, would be the ability to overlay navigational directions inside of a place you have never been. Say you are at the Mall of America for the first time. It’s easy to get lost there. In the future, with Tango, you could hold your phone up and get directions to whichever store you are looking for. That means no more stumbling around, looking for a directory, and potentially saving yourself embarrassment by asking the locals. Check out the videos below, then, share your thoughts. If, say, a new Nexus device was to launch with Tango, would you be interested?